Joe Irwin's death on January 23, 2007 saw the departure from this life of a great friend, an outstanding colleague and a larger than life personality. There's a natural tendency in death to exaggerate a man's qualities, to attribute to him virtues his friends failed to recognise when he was living, to make him much larger than he was in life, but there is no danger of that in Joe's case. Joe was a big man physically and he had the personality to fill the frame. There was no better company to while away a journey, to ease an hour during a free class or to punctuate the brief time over a cup of coffee. And, how Joe loved these coffee breaks! He basked in the relief they brought as he spooned the three or four sugars into the cup and then took a drag of the cigarette after the first sip. His wife, Kitty, used to give out about his sugar intake, and the smoking, but she might as well have been talking to the wall. And then he would start telling a story which wouldn't be well started until the bell for class sounded and the end had to be aborted for a later occasion. When Joe joined the staff at Rockwell in September 1968, having taught at Glenstal, Ennis C.B.S. and Cashel C.B.S. beforehand, his name had already preceded him as an A.S.T.I. activist. He used to entertain us with dissertations on CEC meetings, keeping us informed not only of what had transpired at the latest meeting but giving us enlightened projections on what was about to happen. The years he served as a CEC representative were fairly turbulent times with a lot of change taking place in the Irish education scene. It was the time of the arrival of the community and comprehensive schools, which were met with ferocious opposition by vested interests in the status quo. It was also the time of the Ryan Tribunal on teachers' salaries which delivered nothing to A.S.T.I. members and led to a strike in 1969. Joe was one of the leaders at the local level during these years providing a two-way communications line between A.S.T.I. headquarters and the Tipperary Branch. He was also to the fore in local dismissal disputes bringing his considerable negotiation skills to a number of tricky cases. He was an able dealer, a skilled operator, bringing calm reason and persistence to the negotiation table. He was seldom on the losing side in disputes. In fact I often said he should have been in the diplomatic service. There was no better man when it came to negotiation. He had endless patience, never got tired, was capable of repeating the arguments in different forms and from other angles until the opposition conceded. He always had hours of time to wear the other side down. Probably time was the least important element in Joe's life. A story had to be told, a difficulty had to be explained, a point of view had to be argued and the length of time it took didn't matter. I recall one night visiting him about 8 pm and when I returned home five hours later I realised I hadn't spoken for one hour during the lengthy conversation. Joe was always good for a story and he was a tremendous raconteur. He was able to dramatise anything he told, using his acting ability to imitate the accents of the characters. His colleagues will have their own favourites but he had a number of great tales from his days at Glenstal and one I listened to on a number of occasions was the 'Case of the Missing Postman' in Stradbally, Co. Waterford. He brought wit and good humour to the telling and there was seldom time to hear the end of them. His commitment to drama, which had been developed during his years in the Dramsoc at U.C.D., was immense. He wasn't long in Rockwell when he commenced the production of the annual school play and he set such high standards that Rev. Aidan Lehane stated on one occasion that 'they were never ashamed of the play after that.' He had the capacity to get the very best out of the students, who were transformed by him on the stage and achieved levels of performance we did not believe possible. His production of 'Murder in the Cathedral' by T. S. Elliot will long remain with me as a most moving experience. Joe was a popular teacher with the students. He didn't court that popularity but they recognised in him someone who had their best interests at heart, a friend who wanted them to achieve to their highest potential. An indication of the way he was regarded by the students was the popularity of his six sons, who passed through the college during his years as a teacher. They were well-regarded and never felt under any pressure having their father in the school. Joe retired from teaching in 1990 and continued to lead a full life, producing plays with Cashel Choral and Dramatic Society, broadcasting on Cashel Radio, involved in projects with the Knights of Columbanus, taking pleasure from his family and his growing number of grandchildren. He continued to be good humoured, always with a story to tell and as entertaining company as one would wish to meet. It was a pleasure to have known him. Probably the most momentous event in the College during the academic year 1917-1918 was the decision to abandon rugby and cricket in favour of Gaelic games. The decision was taken in the aftermath of winning the Munster Senior Cup in 1917 when Rockwell defeated Christian Brothers College, Cork by two tries to nil in Cork on March 10th. 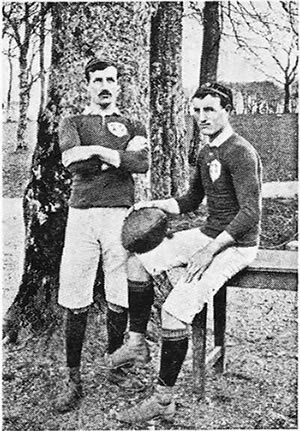 One of the final sentences in a report of the match ran as follows: "From the scrum at the '25 mark Mike Ryan, emulating the doughty deeds of the Mike of international fame burst over the line 'festooned with Christians'." Following that game, eight Rockwell players were selected to represent Munster against Leinster. The announcement of the decision does not appear in the College Journal until October 24th and then only as a comment on the first part of the entry relating to Rockwell travelling to Fermoy for their first Gaelic match. The entry reads: "A notable change has been introduced this year. Foreign games (Rugby and Cricket) are replaced by Irish Gaelic and Hurling. Gaelic will be played until Christmas, then hurling from Christmas to Summer." Nothing else! No reference to a debate on the decision or how the journalist felt about the matter. The decision is generally credited to the President of the College at that time, Fr. John (Johnny) Byrne, who was nationalist in outlook and who was carried along by the nationalist fervour of the 1916 Rising. He was appointed President of the College and Superior of the Community in August 1916. He may have been respondmg to pressure from outside. E. D. Ryan of Cashel had proposed a motion at the 1917 County Tipperary G. A. A. convention calling "upon colleges and secondary schools within our county to give our national pastimes a foremost place in their games." As a result of this motion there was a Schools and Colleges meeting at Limerick Junction on June 2nd. This meeting was called to discuss the position of Gaelic games in the schools and the organisation of competitions for a football cup put up by the Munster Council. Later, Dr. Harty, the Archbishop of Cashel and Emly, put up a cup for a Provincial hurling competition. It was agreed that the Committee governing the competitions have one member per county and that the chairman have a casting vote. The age limit for the competitors should be 19 years on June 1st each year. According to the report, it is not clear if Rockwell had a representative at the meeting, but it is obvious that the College went along with the decision. One of the schools' representatives at the meeting hoped that the foreign games rule would not be implemented too strictly. It would appear that Rockwell fully approved of the decision on foreign games because it seems clear from the decision reported in the Community Journal for October 24th, only Gaelic and hurling were allowed in the school. This may have come about after a further meeting of the Schools and Colleges representatives held in September to organise the competitions for the school year. At that meeting it was also agreed to reduce the age limit from 19 to 18 on January 1st 1918. "Rockwell thus won the Gaelic Football Cup the first year of their appearance in this competition - a truly great performance." And for December 16th, the entry reads: "After breakfast today Fr. Superior received the Cup from the Captain of the team in the study hall and spoke for some time announcing that he would accord three days to be added to the holidays on account of the victory. The strange anomaly of Gaelic and rugby cups standing side by side on the parlour table today may be remarked. Rockwell need have no regrets now in parting with the rugby cup without entering in for its competition this year - it is more than replaced." In January the draws were made for the Harty Cup competition and Rockwell got a bye into the second round. They beat Roscrea by 3-3 to 3-1 on March 25th at Limerick. The final of the competition was a calendar month later and their opponents were Christian Brothers College Cork, the school they had defeated in the rugby cup the previous year. According to the Journal, "The team left for Thurles at half past eleven o'clock. Nearly all the Fathers travelled together with the prizewinners of last year's Intermediate exams. Appended is an account and result of the match: Rockwell 5-5, Christians 3-1." The "appended" account includes the information that the ball was thrown in by Dr. Harty and that the match was vigorously and energetically fought out. At the conclusion of the game, Dr. Harty presented the cup to the winning captain and distributed the medals to the winning team. He stated that "Hurling was one of the most manly, most ancient and most graceful games that the world knows. It was Irish and helped to foster an Irish and a manly spirit - the spirit that was so essential today. It was a game associated with their country's history and could be traced back to the dawn of Ireland's story. There should be no Irish boy but should be proud of this magnificent and Irish game of hurling." The winning team was given: J. Daly, M. Collins, E. o'Donnell, M. Fox, K. Egan, J. Quinn (Captain), M. Quinn, P. Power, W. Heron, W. McCarthy, T Ryan, T. Lynch, T O'Connor, J. Maher, W. Ryan. T Kerwick refereed. The Journal continues: "Rockwell thus secured the two cups for Gaelic football and hurling on the first appearance in Gaelic circles, and the first year the cups were put up for competition. The team arrived home at 7.15 p.m. having paraded through Cashel on their way back." And the entry for April 26th reads: "After breakfast the boys, according to custom, took the cup around the lake. At the parlour door, the captain presented the cup to Fr. Superior. He spoke for some time in Irish, then in English, and then gave the boys a whole day (i.e., free day)." The report for Pentecost Sunday, May19th relates: "During the afternoon Mr. Keogh took photographs of teams etc." The Harty team photograph exists, but the football team does not and neither does the line out of the latter, unfortunately. There is an interesting piece of information in the entry for October 15th: "When Mr. O'Neill was about to leave Cashel en route for class, the police arrested him under the D.O.R.A. regulations." To understand the significance, one has to go back to the entry in the Journal for May 4th 1916, a week and a half after the Rising on Easter Monday: "Mr. O'Neill-lay master - arrested at 7 a.m." he was released at some later stage because he appears in the list of professors in September and continued teaching in the College. He was known for his nationalistic outlook and was a member of Sinn Fein. His arrest at this time was part of the Dublin Castle authorities' clampdown on Sinn Fein members following the party's victories in the by-elections. One of these arrests was that of Thomas Ashe who died as a result of force-feeding while on hunger strike. His funeral on September 30th 1917 was the occasion of a massive public demonstration. Mr. O'Neill also went on hunger strike and the Journal entry for November 16th reads: "Today's paper contained the news that Professor O'Neill of Rockwell had been released after a hunger strike in prison. He was one of a batch of Sinn Fein prisoners." The next entry concerning him occurs on November 16th: "Mr. O'Neill resumed his work today. The boys gave him a hearty ovation on his re-appearance." We hear about Mr. O'Neill's political fate again on March 1st when the Journal reports that he was again arrested as he was leaving Cashel for Rockwell. There is no further news of him for the year. From other sources we learn that Mr. J. O'Neill, as he is referred to in the Journal was more commonly known later as Seamus O'Neill. Born in Dungarvan in 1892, the family moved to Clonmel in 1899 where Seamus received his schooling. He trained as a teacher at De La Salle Teacher Training College, Waterford, and got his first job at Rockwell College. Later he served time in Frongoch, Durham and other places. After his release, he returned to Rockwell where was greeted with a two by four inch card, which read: "We no longer have a job for you"! After that he got part-time work in the High School, Clonmel and in Ring College. He took no part in the Civil War and when the Garda Siochana came into existence in 1923, he joined the first week. He made a rapid rise through the ranks going from Guard to Sergeant to Superintendent in the course of a single week! He remained a Superintendent until he retired in Galway in 1957, apparently having fallen foul of the Garda Commissioner, Eoin O'Duffy. He married three times, had five sons and died in January 1974. He is buried in Deansgrange Cemetery in Dublin. After these two major items of interest, the year's entries are on the short side, covering fewer pages than normal. The College re-opened on September 10th, with about one hundred boys, fifty of them new. The new Dean of Discipline was Fr. (later Bishop) Bartholomew Wilson back from service as chaplain at the Fronts, where he had been for two years, having been decorated with the Military Medal." The following March, Fr. Daniel Leen takes over the position, after Fr. Wilson becomes ill. There are two lay professors, Mr. Ryan and Mr. J. O'Neill. Rev. Messrs Finn, Egan and White were the new Prefects. The Intermediate results were notified on September 17th. Rockwell did not do well. There was no exhibition - nine prizes - four in Senior including medal for trigonometry one prize in Middle, four in Junior. The School Retreat commenced on the evening of September 26th and continued until the 30th. The Retreat Master was Fr. M. Ryan (Fr. Francis O.E) a past student of Rockwell. A free day followed the retreat. It is interesting to read what the boys did on free days. On the day just mentioned, they went for a walk to Cashel. On the day the Intermediate results were announced, they went to Ballycarron on a walk. There was a soiree in the evening. There was another soiree organised by Fr. Muller on December 8th. There was a change in the regulations on October 9th. As there was a danger of Carbide shortage, the change was made. "Class begins at 9.30 instead of 9. From 9.00 to 9.30, there is a half-hour study. Boys go to bed at 9.30 p.m. instead of 10.00 pm. This regulation takes off a half-hour of gas expenditure." The Christmas examinations commenced on December 9th and continued until the 19th. The last exam was Arithmetic from 9.00 to 10,30 a.m. During the afternoon, the boys prepared to go home. The results were read out at 5 p.m. "Twelve boys have been kept back for a day on account of unsatisfactory work during the term, and bad results at exams." Farming concerns also make their way into the pages of the Journal. We learn on October 9th that 'the new tractor was used today to do the threshing. It was quite a success." Later, on November 15th, we are informed that "An under-steward came today to take charge of the farmyard (poultry, pigs, milch cows etc.) He replaces Brother Canice who has got charge of the Brothers'Refectory." There were a number of deaths during the year. On November 19th, we are told that Nurse Armstrong had fallen seriously ill and a Nurse Kelly came to replace her. Nurse Armstrong died on December 3rd. "Her death was deplored by all. She had been most efficient, kind and good in her role of nurse here for three years." She was buried on December 5th in the Community Cemetery. Her brother and her two sisters were present at the funeral. "Wreaths were given by the lay-professors and the boys." Brother Edmond died on March 6th "after a long suffering illness." Two days later Brother Tobias died. The end of the year comes around fast. At the end of April and the beginning of May, we read that Inspectors Ensor and Nicholls came to inspect the Intermediate class. The College exams commenced as early as May 10th and it appears that class resumed when they were over, until the non-Intermediate students departed for the summer on June 13th. The Intermediate exams commenced the day before and continued until June 18th. The students went home on the 19th, with twenty-two remaining behind for the Matriculation exam. The Fathers' Retreat took place from June 23rd to June 30th, followed by the usual dispersal of the Fathers. There are only two entries for August. The first states that only some four Fathers were present during the greater part of the month. The second reads as follows: "Announcement made at Strangers' Mass that there are to be no public Masses henceforth before 8.30 a.m. on Sundays. This had been made necessary by the disorder occasioned through outsiders coming up into the front benches during the Fathers' meditation. Some have been even up in the Organ loft." The entries in the College Journal for September 1918 concentrate on returning staff and returning students. 143 boys returned on September 12th. A Solemn Votive Mass of the Holy Ghost was offered the following day and class began under a new Dean of Studies, Fr. McGrath, who replaced Fr. Kingston. The latter became the new Bursar, replacing Fr. Cotter, who had resigned after eighteen years in the job. "He had been through 'four reigns', beginning with Fr. Nicholas Brennan in 1900." Fr. McAllister became the new Prefect of Worship in succession to Fr. Charles Meyer who resigned. Poor weather was a major topic for the year. The first reference is on September 27th when it is stated that in spite of the bad weather, "the College succeeded in saving the crops because of their own machinery." The College Journal continues "The tractor and threshing-mill bid fair to pay for themselves by their work this year alone." Later, on October 8th, we read that it is very wet, "the wettest six weeks in the memory of men." A week later, the entry reads, "Very heavy rain all this evening, up to 10 p.m."
By September 28th, most of the students have returned and they number 224. The number is divided into 182 boarders, 27 Junior Scholastics and 15 dayboys. Later, after the students return following the Christmas vacation, we learn that there are 15 new students, and that the fee is £40 per year. The boys' Retreat begins on Octo 2nd. It is given by a Redemptorist priest, Fr. Cagney, who spoke a good deal of Irish during his lectures and taught the boys several prayers and aspirations in Irish. Later, at the end of the month, the writer of the Journal begins to make his entries in the Irish language and continues in this vein until the beginning of March. In October, we get the first mention of the Spanish Influenza. This epidemic, which hit the world in 1918-1919, is estimated to have accounted for the loss of about 20 million lives. The entry for October 22nd reads: "Spanish Influenza is reported in Bansha and Golden and seems to be spreading." The Community Council met immediately and decided to make inquiries and then act according to information gathered. As a result of these inquiries, it was learned that there were seven mild cases in Golden. It was decided to send the day-pupils home the following morning and that they remain at home for fourteen days. Three days later, the Journal entry reads: 'We have so far been spared from Influenza, which is raging in many districts and has appeared, they say, as near to us as Camas." As a result of the threat the College is isolated, On October 27"" there is an announcement that nobody is to go in or out of the College, even parents, for a month. Public Mass for the following Sunday was cancelled. It was hoped that this isolation would protect the College from the 'flu. However, all is not blue. As early as September, we read that Fr. Daniel Leen, the Dean of Discipline, took two teams of boys to Dublin for the G.A.A. Schools Sports at Jones' Road, Croke Park. They performed well, winning the Challenge Cup and seven medals. Later, we learn that Fr. Leen "buys and sets up a billiard table in the boys' Library". A Debating Society is also formed. The 'flu continues to dominate the entries in the Journal. One student, Michael Lucey, fainted on November 3th. In this case, it was not the 'flu but suspected meningitis. We learn that there is only one doctor on his feet in Cashel. On the following day, young Lucey's condition is reported to be much worse and his mother is summoned to take him home. On November 7th, it is reported that the disease has hit Templenoe, within a mile of the College. Apparently, someone went to Dublin and became infected with it there and in turn infected others on his return. The Journalist refers to this individual as "Amadfm fear búiodheadh e." A few days later, we read that the anti-'flu vaccine has been obtained but nobody had much faith in it. The College authorities requested permission from the parents before it was administered to any student. Other matters impinoge, but not as much as one would expect. The end of World War I (November 11th) does not receive a mention until four days later. When it does come up for mention, the emphasis is on the continued unrest in Europe. The earliest mention is on October 7th when the entry in the Journal reads ; "The first serious rumours of peace." On October 17th, the Journal says "Conscription seems dead. It was still-born, in truth, never had more than a mechanical life or movement." There are brief references to the General Election in December and to the rise of Sinn Fein. Everything seems well for the new political party. On the day of the election, all the priests went to New Inn to cast their votes" ar son soirse agus Poblachta na h-Eireann." The writer of the Journal regretted to say that two of the Brothers did not go to cast their votes. Christmas arrives and the boys sit their end-of-term examinations. Five boys are kept back for a day because the had not worked during the term and had consequently performed badly in their exams. Because of the restrictions on access to the College because of the 'flu, there is no Midnight Mass on Christmas Eve. The disease, which was kept at bay since November, breached the barriers in January, understandable in the light of students returning to school from many different parts of the country. A novena of Masses, to preserve the College from the disease, was begun on January 16th. Ironically, a day later the disease struck. Quite a number of staff members, both religious and lay, went down with the 'flu. Two days later, it is reported that forty are confined to bed, but that they are all out of danger. A day later, a decision is made to send home the healthy children. Then, as the sick ones recovered, they too were sent home in order that the College could be fumigated properly. The school did not open until February 25th, after which the students returned in dribs and drabs. Not until March 9th was there reading at meals. This had been discontinued during the threat of the Spanish 'flu. The readings from J. M. Stone's "Reformation and Renaissance." "From what we know as to the lack of enduring protection after an attack, it might in any case be assumed that no vaccine could protect for more than a short period." And, "In the uncertainty of our present knowledge considerable hesitation must be felt in advising vaccine treatment as a curative measure." No wonder then the scepticism expressed above about the vaccine provided! The boys had to "pay" for their extended time at home. On April 7th, the President announced that there would be class all through Holy Week. A holiday at Easter was put out of the question by the enforced closure of the College earlier in the term from January 22nd to February 25th. The funeral of Pierse McCann is mentioned on March 9th. "Father Superior and Fathers Kingston and Egan drove to Thurles to take part in the funeral of Pierse McCann, M.P. Fathers English and O'Neill joined the funeral cortege near Dualla, the place of burial. Last May on the eve of his wedding, Pierse McCann was arrested for alleged complicity in the bogus "German Plot" and, without trial, was confined since in Gloucester Prison. While there, in December 1918, he was returned by an overwhelming majority as the Sinn Fein member for our division, East Tipp. Contracting influenza a fortnight ago, he developed pneumonia and, enfeebled by his unjust incarceration, he speedily succumbed. Another martyr in Ireland's cause. God rest his soul" When a Requiem Mass was offered for the repose of his soul at New Inn on March 26th, eleven members of the Rockwell Community. attended. Fr. Muller, from Germany, was Mr. Music in the College at the time. On the same day as Pierse McCann's funeral, Dr Dowling came out from Tipperary and held a consultation with Dr. Cusack about Fr. Muller, who was very ill. Their verdict was that the case was one of hopeless lung trouble. As the knowledge of his imminent demise sank in among the community, the question was raised as to how they would manage for music without him. The possible doomsday scenario did not come to pass, however, and we learn a week later that Fr. Muller was up and managed to play the Chapel organ. To have the strength to do so, he had made a Novena to the Venerable (later Saint) Oliver Plunkett. About a month later, on April 13th, we learn that he grows stronger. There is also news of the boys. There was hurling practice on March 12th to pick a team to play Thurles CB.S. in the Harty Cup. The match was played a week later and Rockwell, the defending champions were beaten by 6-0 to 4-1. According the Journal, "the interruption due to 'fIu had of course shortened our time training for the contest." A couple of weeks later, the College has a half-day on account of a visit by the UCC Hurling team. Rockwell won by 6-1 to 3-1. Also we read that Fr. McAllister went to Thurles to see the hurling match between Toomevara andTubberadora. Hurling activity continued. On April 13th, a team from Boherlahan was expected to come to Rockwell but Dr. Cusack had the match cancelled because the flu' was prevalent in Boherlahan. Early in May there was hurling competition for the Ryan Cup between the Scholastics, Seniors and Juniors. On June 1st, the Scholastics defeated the Seniors to win the Cup. There was also a place for Gaelic football There is a reference to football training on May 15th in connection with the Munster Football Cup Final against Fermoy. There were only two teams in the competition and the Final took place two weeks later. No result is given but, it would appear Rockwell won. Swimming for the boys began on May 22nd. One of them, James Flynn, got into difficulties. Jack Reidy and Matt Walker "pluckily went to his rescue and kept him afloat until the arrival of the boat." Handball was also played. On June 4th, the boys "began a handball tourr:ment for medals." "New Time" came in on March 30th "Rockwell did not adopt it, but adhered to "Old Time", that is, true English Greenwich Time, which it had been keeping, since uniform United Kingdom time was introduced. Accordingly, we have three different times in Ireland: 12 Noon Standard Irish Time is 12.25 p.m. Standard Greenwich Time and is 1.25 p.m. Standaard New Time or Standard Summer Time. Rockwell goes by the second of these." There was also a student death during the year. It was reported on April 10th, that a young aspirant for the Congregation, Pat O'Connor, from Kerry, was very ill, probably meningitis, possibly typhoid. A week later, we read he has recovered somewhat and had received the Religious Habit as a Scholastic. However, he died on the 21st of the month and was buried in Tarbert. The school had a number of inspections. On April 4th, a Mr. Nicholls, an inspector with the Intermediate Board, arrived and examined some of the Irish and Mathematical classes. He returned three days later to finish the inspection. On April 9th, Science exams were conducted by Messrs. Dixon, Twinbull and Ingram, inspectors under the D.A.T.I. Mr. Ensor, Intermediate Inspector of Classics, English and French arrived on May 23rd to inspect the classes. Tension within the Community is suggested in this entry for October 8th. "Superior said Community Mass and preached. It's getting monotonous now listening to same preacher, Sunday after Sunday." The June entries record the end of the year. We get the only mention of the lay teachers: "Messrs. Friel and Curran, lay professors, said goodbye to Rockwell today. Mr. Ryan went to Limerick to act as an Intermediate superintendent. Mr. Harte left for holidays." The exams began on June 10th. The boys rose at 6.40 a.m. and the exams began at 10.00 a.m. Summer Time. The Intermediate exams began with Greek and Trigonometry. There were three exam centres - two in the Refectory and one in the new library. The glass hall served as a refectory pro tern for the boys, the Prefects taking their meals in the Senior Reading Room. Class continued for non-Intermediate students. By June 14th, most of the boys had finished their exams. About twenty boys from the neighbourhood went home. According to the Journal, "in general the papers this year were reasonable. They were set by the Inspectors who understand what a boy may fairly be expected to know." On June 16th, most of"the boys left for home. A few remained for Science and Commercial subjects. The Matriculation exams were held from June 19th to 23rd. Three boarders were still left on June 26th. There is a mention of the Peace being signed on June 28th. After that there was the usual summer dispersal of the Community, with the exception of Fathers Muller and Schmidt, who as German nationals, "had to remain, as the wartime restriction of their movements had not been removed." The War of Independence impinged on life in Rockwell College in a major way during the period September 1920 to June 1921. The first entry in the College Journal to mention the subject appears on September 12th. According to it, one of the lay teachers, Seamus O'Neill, was arrested by the military near Blackcastle, Rosegreen. Reports varied as to what work was afoot there. One report stated it was an "Arbitration Court" of Sinn Fein. Another version was that it was a sort of Volunteers Manoeuvres. The writer goes on to give his own version: "The truth seems to be that it was a meeting of the Chief Volunteer officers of Munster." He adds a rider, "O'Neill, when taken on the staff after his previous imprisonment, had given the Superior in writing a pledge not to take part in any such proceedings." The teacher in question, known as the "Professor", was born in 1892 and was one of the Clonmel group involved in the Easter Rising of 1916. He was arrested in Rockwell in 1916 and on two later occasions because of his Sinn Fein involvement. He spent a term in Frongoch in Wales. He later joined the Garda Siochana and became a superintendent, serving in many places, including Galway. His son, Niall, was Principal of the Vocational School in Clonmel. He died in 1974. Eight days after, September 20th, the College was raided. A Flying Column of Lancers, numbering from 60 to 1OO, raided the College. The raid lasted' an hour. There were about half a dozen officers. The Commanding Officer, Captain de Burgh, was very courteous to the Superior, assuring him that his only objective was to searc;h Mr. O'Neill's room and that he had no intention of disturbing any of the Fathers. On their arrival, they put pickets along the main avenue and at the main principal entrances. There were three main search parties, one going to the Infirmary, another to the Rock and boat house and third to O'Neill's room and the Fathers' Corridor. A number of places were ransacked. The proceeds of the raids were two Irish Volunteer Drill Manuals which were found under 0'Neill's mattress, as well as Fr. Colgan's fowling piece and the farmyard gun, both found in Fr. Colgan's room and removed, although he had a permit for the former. On September 28th, the military broke into Carrigeen in the early hours of the morning and searched it. They also woke up the brothers Hennessy on Rockwell Hill but did not search their cottage. They were searching for a man "on the run". In the middle of October, it is reported that shooting was heard in the direction of New Inn. On the 17th of the month, a collection was made at the door of the Chapel during the People's Mass in aid of the fund for the Belfast expelled workers. £8 was realised. There are two interesting entries for October 25th. "The War in Wexford" by H. B. Wheeler and A. M. Broadley was begun as reading during dinner in the Community Refectory. Also the death of Terence McSwiney was recorded. The entry for October 28th reports on the ambush near Thomastown in which three soldiers were killed and five wounded. The writer adds, "That will bring reprisals fairly close to us. Some did take place in Golden and later on in Tipperary." The following day it is reported that there was Solemn Mass for the repose of the soul of Terence McSwiney. On November 3rd, five Rockwell priests went to New Inn for a Solemn Requiem for "young Murphy, a hunger striker, who died in Cork gaol." There is a lull in activities until December 19th when it is reported that a military lorry came a little way up the back avenue about 4.25 p.m. There was no Midnight Mass on December 24th owing to the disturbed state of the country. However, all was not gloom. The entry tells us that on Christmas Day after dinner, the Community had coffee vieux style in the parlour and some songs." The entry for December 30th informs us that on that morning, it was found that two double trenches had been cut on Rockwell Bridge. They were filled in during the course of the day. It was reported in the middle of January that a tree was felled near the front gate, "seemingly in connection with an attack on New Inn Barracks that night." Two days later there were sounds of firing and some loud explosions heard from the Golden side. There was no morning post on January 24th, "owing to the roads being trenched between Cashel and Goulds Cross." A week later, we are told that "two of our trees were found felled blocking the road near the front gates." On February 18th, Rockwell Bridge was again found trenched. "Mr. Folker, C. O. Cashel, called on the Superior and commandeered some of our workmen to fill in the trenches." The following day, the entry reads, "For some time past, owing to the state of the times, no mail car has been running between Cashel and Goulds Cross. This has led to the disorganising of our postal service." On March 5th news came of a Black and Tan having been shot in Cashel the previous night. "The town is in consternation, apprehending reprisals. The Officer, however, held his men well in hand." Cycling became a subversive activity as an entry on May 1st suggest. "A proclamation forbids cycling without a permit in the Cashel Inspectorate." Earlier it had been reported that Condon, the tailor Brother's assistant, had been arrested in Tipperary for riding a bicycle after 8 p.m. He had to pay £2 to redeem his machine. On May 5th very heavy firing was heard about 9.30 p.m. in the direction of New Inn. There was no post or papers on May 7th, owing to the blocking of the G.S.W.R. line by the destruction of the bridge spanning the line at Holy Cross. About a week later, it is reported that "Grogan, a neighbouring farmer, had his house at Shanballagh destroyed as an official reprisal." The College was the centre of activity once again in June. On June 8th, it was reported that during dinner time, some fifty of the Crown Forces came and made a perfunctory search of the College. They contented themselves with passing through the Boys' Dining Room, the parlour building and the Fathers' Corridor. Most of the troops remained outside. Two officers requested the Superior to sign a certificate that nothing in the house had been damaged or stolen. Later on, when the troops had gone, it transpired that at the Calvary under the Rock, the statues of the Blessed Virgin and St. John had been shattered. There was a Black and Tan picketed there and he seemed to be the worse for drink. The Superior wrote, reporting the matter to the C.O. Tipperary. The raid lasted about half an hour. A week later, a convoy of military lorries commandeered "some of our goal posts to help them get over the damaged Rockwell Bridge." They restored the posts. On June 21st, during the Annual Retreat for the Community, the Crown military forces encamped for the night on the Scholastics' playing field. That night, the LR.A. and the Crown Forces had an exchange of shorts at Garranlea. This is the last mention of the political disturbances. The Truce came into effect on July 11th. In spite of all the disturbances the College's academic year began on September 6th. The railway strike in the west made it hard for some of the boys to return. Some had to pay as much as £10 to motor over from neighbouring counties. The Staff was much the same as the previous year. The Community included Fathers Muller, Schmidt, Colgan, McGrath, Kingston, O'Neill, Meagher, Egan, Meyer, Leen, McAllister and McCarthy. There were three Fathers who were not on the teaching staff, the Superior, Fr. Byrne, and Fathers Cotter and Walshe. The Prefects (C.S.Sp.) included Rev. Messrs. McCarthy, Finnegan, Mansfield, Liston, Maguire, Neville, McGree and Foley. The lay teachers were Messrs. Ryan, Harte, O'Neill, Gallagher and Twomey. The Brothers were the same as the previous year with the exception of Brother Virgilius who had died. Brother Malachy's post as Parlour Brother was to be shared by Brother Canice and a servant. The total number of boys was 150 with the Junior Scholastics numbering 41. This was the year of the "Bleeding Statues" in Templemore. Fr. Leen went to the town to investigate. His conclusions are interesting. "While he was deeply impressed by the faith displayed by the people, and while testifying to the presence on the statues of what seemed to be dried blood, he reserved judgement as to the nature and origin of the phenomenon." He was correct in his reservations. An entry the following May reads, "In connection with the 'Bleeding Statues' of Templemore, the Archbishop got from the boy, Walsh, a signed confession, acknowledging that it had all been an imposture." Classes began on September 7th with six 10-minute classes between 2 and 3 p.m. There was a half-day on the following day. There was a free day for the Intermediate Prize List on September 13th. Because of the disturbed times, there was no walk. Rockwell won fourteen distinctions - three Exhibitions, 8 prizes, 1 Medal and 2 Composition Prizes." The Boys' Retreat began two days later and lasted four days. A free day followed and the boys went for a picnic to the Rock of Cashel. After tea that evening, they had a soiree. There is an unusual entry for September 26th. "At 9.30 twenty-eight boys ran away. Four of them returned in a few hours. The Dean, Fr. Leen, overtook them near Dundrum but failed to induce them to come back. Five leaders were definitely excluded while the others were back within a fortnight. Their flight seemed to be due to the idea that we should have a week's cessation of work to show our sympathy with the Lord Mayor of Cork, who is dying of hunger in Brixton gaol." There is a report on October 7th which has this to say. "Most of the runaways back. E. Hickey was sent to Blackrock. He was not a runaway, but seems to have incited the others to go." It is reported later that two boys ran away on January 30th. The Christmas exams ended at 11.30 a.m. on December 16th. The results were read to the boys at 8 p.m. that evening and they left for their vacation on the following day. On Ash Wednesday, which fell on February 9th, the boys went for a walk to Knockgraffon. The College was visited by an Inspector on May 2nd. A Mr. Ensor inspected the English, Classical and Modern Language classes. There were three cases of mumps among the Scholastics on May 6th. They were isolated in a new ward over the Bursar's Room. There was a fresh case on the 17th and three further cases on the 23rd. On June 7th, Mr. Nicholls of the Intermediate Board inspected the Irish and Mathematical Classes. A week later, we read that "the boys packed their trunks". The day after, about eighty boys went home, leaving a similar number behind for the Intermediate Examination. There is not a great amount about games during the year. On November 21st, the first team played and beat Cahir at Gaelic football. On December 8th, which was a free day, the Juniors beat the Dayboys at football. On January 30th, the Seniors beat the Scholastics at hurling. On April 13th, the boys began a· series of medal matches in hurling. There are a number of further references to medal matches but no mention of contests with other schools. The winners of the Competition had a special spread at dinner on June 12th, after which the Superior distributed the medals and addressed a few words to the players. The boys had their first swim on June 3rd. There were a number of celebrations during the year. On October 4th, there was coffee in the refectory after dinner to celebrate the new interim grant from the Intermediate Board. The grant worked out at some £37 per head for every qualified teacher, clerical and lay. They had more coffee the following day, in honour of a visitor. However, it was a mixed blessing "to have fifteen of us confined for an hour in our stuffy refectory." On November 18th, the sugar supply ran out owing to difficulties of railway transport. Gavin Duffy's "Life of Davis" was the reading at dinner in January. A supply of Wolfhill coal was received on February 7th. It was rather hard to kindle. Fr. Michael O'Shea's legacy of £500 for Masses was a welcome present on February 8th. On March 27th, there was coffee in the parlour after dinner and Fr. Egan upheld the thesis that "Ireland is not a nation." There was very bad weather in September and October. There are a number of references to gales and downpours. There was a stamp crisis in October. The old system was that all letters were given to the Bursar for stamping. According to the Journal entry, this was open to abuse by persons not belonging to the Community. Under the new system, the members of the Community had to apply to the Bursar for a supply of stamps and had to stamp their own letters. During the same month, an attempt was being made to have the prayers said in Irish. On October 9th, it is reported that a vaporised petrol lamp, known as a Quick-Lite, was tried in the Quadrangle and was a great success. It had been in use in the Lake House for the previous month. On April 3rd, we read that Rockwell adheres to true Greenwich time, which is 25 minutes behind Greenwich. There is a fascinating entry for April 26th. "A postulant, Cummins, either sleepwalking or delirious, clambered out of the upper Infirmary windows, and fell on the concrete walk at the cellar door. Save for bruised heels, he was uninjured." We are given more information the following day. He was diagnosed as having scarlatina and was transferred to Cashel Hospital. "The infection seems to have come through Mrs. Quinn, one of our milkers, so she was ordered to cease milking for the present." The first entries in the Community Journal in September 1921 give information on the members of the Community and Staff. Fr. J. Byrne is the Superior and Fr. J. Cotter is his First Assistant. Fr. J. N. Muller is the organist. Fr. J. McGrath is the Dean of Studies. As well as fulfilling the post of Bursar, Fr. J. Kingston also teaches some classes. Other teaching members of the Community include Frs. C. Schmidt, M. Colgan, P. Brennan, L. J. Ward, P. J. Meagher and D. Leen. Fr. Leen was also Dean of Discipline. Fr. P. McAllister is the Prefect of Worship. The Junior Scholastics have Fr. J. McCarthy as their Director. He also takes singing classes in the College. Fr. J. O'Neill is the compiler of the Journal. The new Prefects were Messrs Mullane, Danaher and Mackey. Mr. Danaher was in charge of Junior discipline while his two colleagues were in charge of study. Mr. Mackey also assisted with the singing classes. Mr. Mansfield, who had been a prefect the previous year, came back as a member of the lay staff, but curiously still dressed in the soutane. The other lay teachers were Messrs. Harte, Gallagher, Twomey, Nagle and O'Shea, the last-named taking up the position of Science Master. Two lay teachers from the previous year, S. O'Neill and M. J. Ryan, did not return. The former was in prison for I.R.A. activities. The following January he was to pay a visit to the College. He was released from prison in consequence of the amnesty following the ratification of the Treaty by the Dail. Also gone from the previous year was Miss Byrne who had been in charge of the dairy. Brother Eusebius was also absent. He was currently a patient in the St. John of God Hospital in Dublin. However, he made an unexpected. appearance in Rockwell three days after the re-opening of the College for the new school year, having absconded from the hospital three days previously. However, his sojourn in Rockwell on this occasion was brief. He was sent back to the hospital. T. Enright was the farm steward and Miss Marrinan was the nurse. The boys started returning on September 6th. By the time they had all returned, they numbered 124 boarders, 36 Junior Scholastics and 15 dayboys. A week later, the Intermediate Prize List arrived. Rockwell received four exhibitions, six prizes and four composition prizes. The results arrived on September 19th and a free day to mark the achievement was awarded. The average of passes was practically double the All-Ireland average. In Middle Grade, 30 passed out of 32. The boys went to Athassel Abbey, near Golden, on a picnic. Fr. O'Neill and three of the lay teachers cycled to Killusty and scaled Slievenamon. There are numerous entries in the Journal concerning the I.R.A. and their presence in the neighbourhood. On September 25th, some LR.A. officers brought to the Superior's notice the fact that one of their number from an outlying area had exceeded his powers in presuming permission to remove some chemicals from the science laboratory four days previously. The individual at fault agreed to restore what he had taken. The following day we are informed that a section of the I.R.A. army took up their quarters in Carrigeen. Frs. Byrne, Kingston and Healy went to Kilfeakle for the Mass for Sean Tracey on October 16th. To mark his death, a business holiday was ordained by the I.R.A. in the South Riding of the county. However, Rockwell had class as usual. We are informed on November 9th that a college servant, named Brophy, was arrested by the I.R.A. for shirking his volunteer duties. He was detained for fatigue duty in Carigeen and had his rather luxuriant locks shorn. On the 25th of the same month, the College had a visit from Messrs. Robinson and James Flynn of the LR.A. The latter was a recent past pupil. On February 16th, a Journal entry tells us that Mr. Bradley, father of one of the students, was seriously wounded in the anti-Catholic pogrom in Belfast. Two days later, we learn that Mr. Shine, father of another of the students, was wounded by the I.R.A. for expostulating with a pitchfork when they came to distrain his cattle in penalty for his refusal to pay the I.R.A. levy. On St. Patrick's Day, Eamon De Valera came to spend the night in the College. He was accompanied by his secretary, Sean McBride, and by Cathal Brugha, who was Fr. Kingston's brother-in-law. De Valera said a few words to the boys and got them a free day. According to the journalist, "He was dreadfully hoarse and haggard-looking." On the following day before his departure, De Valera signed scores of autographs for the boys. He did some vaulting (sic) by way of exercise and had some revolver practice with a Colt automatic. He and his party, accompanied by Joe McDonagh, T.D. and a past pupil, left soon after 11 o'clock to hold an anti-Treaty meeting at Killarney. It may have been a repercussion to this visit but a political argument developed over dinner about a week later. The entry reads: "Over the veriest trifle, there arose at dinner one of these unpleasant disputes, now fortunately very rare." There are a couple of further entries in the Journal for April. On the first day of the month, we read that all sorts of rumours were afoot concerning some shots fired from a motor car near the gate by the I.R.A. We are told that a drop too much was the key to the mystery. Maybe it was the day that was in it! Two days later, some of the servants were summoned to an I.R.A. meeting at New Inn. The men there refused to take the oath to the new anti-Treaty executive. On April 12th, we learn that a former dayboy, W. Luddy, was buried with military honours. He had been arrested during World War I and his incarceration in Pentonville Prison undermined his health. The boys were unable to return after the Easter holiday because the trains were not running. By wayof protest against Rory O'Connor's militarism and against interference with the people's freedom of speech and with the liberty of the press, the trade union movement had ordered a general stoppage of work from 6 a.m. to 6 p.m. The entry in the Journal for May 2nd gives a personal viewpoint. It states that the Republicans were besieging Free State troops in the R.I.C. Barracks at Annacarty. Two of the College servants were acting with the besiegers. The journalist goes on "Shall we ever learn from the past and can there be no centripetal force for us save hatred of England?" The letter from the Bishops of Ireland on the state of the country was read at the Community Mass on the first Sunday in May. It condemned gun rule, affirmed that the only correct and moral course was to follow the people's voice as expressed for the time being in the Dail and later in an election, and it finally counselled acceptance of the Treaty. The Bishops' letter fell on deaf ears. Two weeks later we read that two of the college servants, Bill and Tom Meehan, were taken from their beds and beaten by the I.R.A. The year ended with plenty of political trouble. Trains stopped running, with lines being ripped up in several places. Trouble was brewing all over the country. All was not gloom, however. As early as September 15th, we are informed that a shorthorn heifer, belonging to the College, took first prize and a cup at Tipperary Show. While the boys were on retreat from September 28th to October 2nd, some of the lay teachers went for a holiday to Lisdoonvarna. On October 27th, an elocutionist, Valentine Voubden, gave a number of clever character sketches from 8 to 11 p.m. His fee was five guineas. The evening concluded with a "pithy speech" from the Superior and the singing of the Soldier's Song. The community had punch on two consecutive days in December in connection with the visits of distinguished people. On May 13th, Fr. McGrath and Mr. Mackey went off to Dublin with a "Galaxy" of ten prizewinners. They stayed at Blackrock College overnight and went to the hurling final at Croke Park the following day. They did not return until the 15th and spent the forenoon in Cashel. That was a free day, which the Archbishop had given a week earlier during a visit to the College. Fr. McCarthy took the Junior Scholastics to Athassel for a picnic. The boys, on their own initiative, got up an impromptu sports, which were quite a success. The students had reading during meals, one book for breakfast and a different one for dinner, They started the year with "The Priest on the Mission" by Oakley for breakfast and "Literary History of Ireland" by Douglas Hyde for dinner. When the latter was finished, "My Life in Two Hemispheres" by Gavan Duffy was begun. On September 30th, Frs. Kingston and Colgan went to Dunne's in Clonmel to see about purchasing a motor lorry but no deal was done. Early in October, the lay teachers began donning the academic cap and gown. In December, we learn that stones and mud from the farmyard were being dumped on the lakeside walk near the sluice by way of tarmacadam. In January, a Belfast engineer came to fix the furnace and the heating apparatus near the bootroom. The job lasted three weeks and the engineer was accomodated in the infirmary during his stay. Fr. Leen paid £35 in February for a billiard table with an assortment of cues, balls etc. It was bought from the British Army Barracks in Cahir when the troops were evacuating the town. In the same month, there is a rather cryptic entry : "We have been killing our own mutton of late. Economically, it may be an improvement, but it can hardly be called a gastronomic one." The lorry was never bought and in March, Fr. Leen went to Clonmel to hire one to take 60 boys to Limerick at the end of the month. In the same month, some gravel was put on the avenue, "a little more lavish than Fr. Cotter's annual 'pinch of snuff'." In April, repairs were carried out to the "Castle" in the Rock. The idea was to raise a pedestal of masonry inside the castle. However, the foundation proved unsound and the project was abandoned. Instead, a girder-supported floor was built on the top storey and a pedestal raised from that floor. The purpose of the pedestal was to carry the statue of Our Lady, which was swung into place on the last day of the month. A photographer from Keoghs in Clonmel came to the College in the middle of May to take group photographs of the students and staff. On June 22nd, one dynamo and an oil engine arrived from Middleton. They were intended to light the house with electricity. Brother Dalmas went to Portarlington to see after a steam engine that might be of use for the College sawmill. News came in October of the death of Joe Geoghegan in a motor accident in California. He left Rockwell in June 1920 and studied at the National University of Ireland for a year before going to the U.S. The news turned out to be false. An entry at the end of January related how news of his tragic death was false. He had, in fact, survived the accident. Brother Silas died on February 8th, aged 83 years. An entry in November stated he had been laid up for the previous month and was very troublesome and noisy at night. Most of his life had been spent in Rockwell as a commissionaire and then as a shoemaker. He was in charge of the building of the science room wing, often called "Silas' House". There are not many references to games. A Gaelic football team went to Cahir in the middle of October and defeated the local team in a rather "scraggy" football match. There was a return game in December and the College again was successful by a point. The Cahir side grumbled about the refereeing of Mr. Nagle, a member of the lay-staff. At the end of March, the hurling team motored to Limerick for the final of the Harty Cup and were beaten by one point by St. Munchin's There was disappointment over the result "but it was mild compared to what it would have been in the rugby finals. Neither we nor Blackrock hold any Cup this year. Rather a record!" Fr. Leen attended a G.A.A. meeting at Limerick Junction on April 8th and he was a Munster delegate to the G.A.A. Congress a week later. The final of the medal hurling matches was played on May 7th. A few days later, the school sports were completed with swimming. In the course of one of the swimming competitions, Mr. Mullane jumped into the lake in his soutane to rescue W. O'Brien who had got into difficulties. The end of the year brought some athletic success. On May 27th, Fr. Leen took a team of nine to Dublin to compete in the intercolleges sports at Croke Park. The Irish Independent reported on May 29th that "the most successful of the Colleges were St. Finnian's, Mullinaar and Rockwell. The latter, as well as "winning several senior events, also took the senior relay." The team included W. Byrne , T. F. Moloney, J. Scanlon and T. lee. The last-named, from the Glen of Aherlow, was undoubtedly the star of the Rockwell success story. He came first in the 200 metres, the 400 metres, the Long Jump, a well as being a member of the winning relay team. He also came second in the 12 lb. Shot. In all, the College won nine firsts, three seconds and nine thirds. Other items of note during the year included the information that Rockwell adhered to true Greenwich time during the summer and did not put the clocks forward. This was a cause of embarrassment in May when the Archbishop, Dr. John Harty, paid a visit. He arrived at 3 p.m. "summer time" and was expected at 3 p.m. "Greenwich time". The result was that the boys were not out to receive him with a Guard of Honour. On May 25th, it was recorded that O'Connor, a fitter, who had got a temporary job in the house, took Fr. O'Neill's bicycle without leave some days previously and left it badly damaged. He also took Fr. Colgan's. Fr. O'Neill recovered his machine in the barracks in New Inn. However, no trace had been found of either O'Connor or Fr. Colgan's bicycle up to June 14th. The previous October, Fr. Schmidt had his bicycle smashed by hitting a stone on the road as he rode home from Clonmel. There were at least four visits from inspectors during the year. One of them, Mr. Ensor, who came in April "simply spent a few moments in the exam hall." During the Easter holidays, the boys who did not go home and the Junior Scholastics went to a matinee at the Kinema (sic) in Cashel. There was a piano concert for the boys in May and, according to the journalist, "it was good but rather too classical and monotonous for the boys." No reason is given but after June 29th, 1922, the Journal entries are in Irish and continue in that language until the end of July. Rockwell College suffered many disturbances during the school year 1922-1923, a year which coincided with the Civil War, which officially began with the shelling of the Four Courts at the end of June 1922 and ended with the order to the anti-Treaty force on May 24th, 1923 to "dump arms" and "cease fire". The Journal, kept by a member of the Rockwell Community, contains numerous references to the impact of the war on life in Rockwell. The College re-opened on September 14th when about 46 boys "managed to get back". It took some time for the schoolboy population to build up to a final figure of 101. There is a fascinating entry of October 2nd - "Boys continue to dribble in. Two have just arrived from Castletown Bere. Thence they had a thirteen-hour voyage to Cork, aboard a cargo boat laden with pigs. Many of the poor brutes got seasick and had to be jettisoned. From Cork the pair came here by motor." Another entry for January 7th 1923 states that a boy named Condon from Valentia arrived that day. He had been unable to travel during the previous term. We can only presume that this was because of the disturbances caused by the war. All the Fathers had returned to the College by September 14th, with the exception of Fr. McAllister. He was referred to in the Journal as Prefect of Worship in the 1921 entry but now is given the title of Prefet de Culte. All the lays (sometimes referred to as lay hands) returned, with the exception of Mr. Mansfield. He's referred to in an entry for the previous year as "ex-prefect, still wearing the habit" He eventually arrived back on September 17th as a layman. On December 16th he left to join the new Civic Guards in Dublin. There is a bit of bad news. Fr. Cotter, the Assistant Superior, had some sort of seizure on the first evening of term and fell downstairs. He was put to bed. However, things did not seem to be too serious as he was up and out the following day and heard confessions. But it must have been a false recovery because we read that the next day that he was sinking fast and was anointed. He expired at 10 a.m. on Monday, September 18th. The religious community of Rockwell College at that time was comprised of Fr. J. Byrne, the Superior and his assistant was the above-mentioned Fr. J. Cotter. The Organist was Fr. N. J. Muller, a German. Another German member of the Community was Fr. C. Schmidt. Fr. J. McGrath was Dean of Studies and Fr. J. Kingston was Bursar. The Journal was kept by Fr. J. O'Neill. There was also Fr. M. Colgan, Fr. P. Brennan, Fr. P. J. Meagher and Fr. T. Cunningham. The Dean of Discipline was Fr. D. Leen. There was also Fr. P. McAllister, mentioned above, Fr. J. McCarthy, Director of Scholastics and Master of Singing. All the Fathers took class except Fr. Superior, Fr. Cotter and Fr. Kingston. The Prefects were Mr. Mackey and Mr. McGrea who were in charge of the study, Mr. Murren and Mr. Hanrahan who were in charge of the Seniors and Mr. Danaher and Mr. Reidy who were in charge of the Junior. The lay teachers were Mr. Gallagher, Mr. Twomey, Mr. Mansfield, Mr. Nagle and Mr. O'Shea. Mr. T. Enright was the Farm Steward and the Nurse was Miss Marrinan. There was a rather leisurely introduction to the year. On the day after arrival, the boys had six ten-minute classes from 12 noon until 1 p.m! They did have class on Saturday and on the first Saturday, there were six half-hour classes. There was a problem and that was light. The Community and the students had to make do with candles as the electric light was not yet fully installed. The old gas lighting system throughout the College was in the process of being replaced. The old acetylene fittings had been removed throughout most of the College. Apparently the work of installing the electric light had gone on during the summer. It was hoped to have it ready for September and the beginning of the new school year but the work was badly hampered as there were no trains "to bring in the needed apparatus." By September 19th, the electric light was on in the Fathers' rooms but it was very weak. "We miss the acetylene". The light continued to be unsatisfactory. On October 5th it was reported that a storage battery of 54 cells was being obtained. Six days later there was no light for two nights as the storage batteries were being charged. On October 12th, it was reported that the newly-charged batteries were providing light and it was a great improvement. But October 17th brought another hiccup. The light was cut off when a carpenter inadvertently drove a nail into the wires. In December we learn that a new engine had been purchased to drive the dynamo. When it arrived it was found to have been damaged in transit. On the night of celebration to mark the winning of the Harty Cup in April, the light short-circuited and the boys went to bed at 8.30 p.m. The disturbed state of the country was evident in other ways too. A postal strike started on September 9th. There were few outsiders at Fr. Cotter's funeral on September 20th - because of the strike, it was impossible to inform people of his death. The same was the case at the funeral of a former Provincial, Fr. Cornelius O'Shea, who died in Cork. His body was brought to Rockwell for burial in a Ford touring car because no motor hearse was procurable. The postal strike ended a month later, on October 9th, but a strike on the Great Southern and Western Railway a week later stopped letters and papers. Near the end of the month, there was a further problem. Some mails arrived at the college, bearing the legend, "Censored by the LR.A." There had been a hold-up of mails in Boherlahan, between Cashel and Holycross. One of the boys, Brendan Mallen, developed appendicitis on Septernber 25th, He was brought to Cashel Workhouse the next day and operated on by Drs. J. Ryan, Cusack and Foley. Mr. Mackey, one of the Prefects, amid a downpour, rode to Tipperary to get Dr. Ryan to come. Mallen must haye recovered because we read no more about him. On February 17th, we read that a student named Feehan ran away, seemingly with some idea that it was his obligation to report for duty to the Fianna. He returned two days later. The examination results were good. The Journal entry reads. "Our passes were excellent. In total, they got 78 out of 89, a percentage far exceeding that of the rest of Ireland. There was a free day for the results on October 3rd. The boys walked to the Rock of Cashel. Immediately after dining, the boys came home as the evening was threatening." Six days later, the Intermediate Prize List arrived. Rockwell was awarded four exhibitions, three book prizes, two composition prizes - nine distinctions in all. The boys got the following day off. The Civil War impinged on the life of the Community and the School. On September 16th, we learn that Fr. O'Neill, who went to Clerihan on ministry, had to make a rather devious journey as the Irregulars had barricaded the roads in preparation for an abortive ambush in New Inn. During the second week of October, there was a pastoral letter from the Irish Bishops, condemning as immoral the Irregulars' armed resistance to the will of the majority of the people and forbidding the sacraments to be administered to such as persisted in the armed revolt. The letter also suspended, ipso facto, any priest who publicly or privately advocated or encouraged armed resistance. The letter had to be read at the public Masses in Rockwell on successive Sundays. On November 3rd, Free State troops did a round-up at Heffernan's near the back gate of the College and the officer commanding, O'Dwyer, mortally wounded Iregular leader, Sadleir. Both O'Dwyer and Sadleir were both former Rockwell students. Miss Marrinan, the Nurse and Fr. McAllister were sent to attend the dying man. A week later we read that half-a-dozen Irregulars were captured in a dugout at Ballydoyle. They included two Rockwell past students, Gus McCarthy of Fethard and Andy Moloney of New Inn. A few days later, there was another abortive ambush by Irregulars at Marlhill - a tree was felled after the Free State troops had passed. There was a sign posted on the tree that nobody remove it on pain of death. It was not, in fact, moved until January 3rd. On December 3rd, people coming to Mass in Rockwell were horrified when passing the crossroads near Cliffords to see a man lying on the road with his brains blown out and with a label attache'd to his clothing, alleging he was a spy and had been shot as such by the Irregulars. Two days later, we read that a military cycle patrol arrested Patsey Carey, a Rockwell worker, and took him to Cashel for having in his pockets incriminating literature, notably, a military signal code. However, on the following day, through the good offices of Commandant W. Quinlan, another former Rockwell students, Carey was released at noon. A week before Christmas, Free State troops on the march from Kilkenny turned into the College about 1 p.m., drenched and weary and asked if they could have food. Dinner was provided and a "chit" for payment was proffered. The usual Midnight Mass was not celebrated on Christmas Night because of the disturbed state of the countryside. We read for January 14th - 'Some of our servants were commandeered last night to help or rather to screen the Irregulars in communication-blocking arrangements. A tree of ours, adjoining Marlhill, was felled in the process." Because of the republican leanings of the College President, Fr. J. Byrne, there were regular rumours that Rockwell was a haven for Irregulars. As early as November 15th, the Journal entry stated that a report in Tipperary Town claimed that Rockwell had been raided from roof to cellar the previous day by Free State forces. The writer was concerned about the report which was groundless. "These lying rumours grow monotonous." But, groundless or not, they persisted. The entry for February 24th reads; "The Archbishop called and, in a half-hour's talk with the Superior, had his mind disabused of some of the ideas engendered by the reports that branded Rockwell as a centre of Irregular and anti-episcopal activity." On March 2nd, a tree was felled by the Irregulars near the back gate and this prevented the fishwoman from getting past to deliver her wares. Three local Irregulars were captured and one of them was John O'Brien, who, until some time previously, had been assistant cook in the College. The rumours had some influence on the civil authorities. On March 3rd, about 30 Free State troops searched the grounds and the servants' quarters. Less than two weeks later, the place was searched again, on this occasion the servants' quarters, the farmyard and the Lake House. In the last-named building, John O'Brien, nicknamed Scaddy or de Valera, was captured. O'Brien had been gassed in France, when fighting in the British Army during World War I and was drawing a British pension. Also arrested with him was a man called O'Neill, who was Brother Nicephorus' assistant tailor. There was another thorough search of the College by the Free State soldiers on April 14th. They had heard that Eamon de Valera was hiding there. The soldiers arrived again at 5 a.m. the following morning and remained until after the People's Mass. O'Brien was released from prison in Templemore on May 5th as his health was poor and he had signed an undertaking not to share in armed resistance to the Free State. There was a further search of the College on May 13th. It began at 5 a.m. and covered the farmyard, the Scholasticate and the servants' quarters. A baker, by the name of Grace, was arrested but he was released later on the intervention of an ex-Rockwell student, Sergeant Brophy. There was another raid at 4 a.m. four days later. It was to be the final raid of the school year. In spite of the political turmoil in the land and the interference with ordinary life, the daily routine continued at Rockwell. There was long spell of dry weather. There are a number of references in the Journal to the lake drying up. The entry for October 14th reads - "The fish are dying in scores in the diminishing lake, the roach resisting better than the trout." The scarcity of things was felt. On November 27th, the entry reads - "The coal supply is short and the stout can't be got any longer from Clonmel. The Fathers, many of them cut and carry their own fuel, are referred to by the writer as "the hewers of wood and the drinkers of water." For December 8th, the Witch Scene from "Macbeth" and some other dramatic selections were produced by Mr. Hanrahan, the Senior Prefect. The Christmas examinations were held from December 15th to 19th. The results were read out at 5.30 p.m. on the last day. Afterwards, there was a dramatic entertainment. Naboclish, a comedy in two acts, as well as other entertainment, was put on at 7 p.m. The following day, the boys went home. They had to walk most of the way to the railway station in Cashel and depart baggageless because, owing to the sudden frost, cars could not travel in time. In January, the electric light was installed in the St. Joseph's House, the Scholasticate, and, soon after, work commenced on the wiring of the Chapel. Around the same time, the front avenue was "well-macadamized and cambered" and the back avenue patched. In March we read that the road to Cashel is being steamrolled "after a fashion". There is no mention of rugby or cricket during the year and occasional references to Gaelic football. The chief game was hurling and the College had a good team, winning not only the Harty Cup, but the All-Ireland as well. The soldiers may have been searching the grounds of the College but this did not prevent the boys from getting in their hurling practice. The semi-final of the Harty Cup was played on March 18th. Earlier, Fr. Leen, the Dean of Discipline, tried to secure Cashel Sportsfield for the game against Thurles "but Mr. Looby refused to let us have it." No reason was given for the refusal, which leaves one intrigued. The loss of the home advantage did not make any difference as Rockwell had a comfortable win over Thurles C.B.5. The final, against limerick C.B.S., was played on April 22nd. The reporter on The Tipperary Star set the scene: "Sunday in Thurles reminded me of the old days before the Troubles arose in this grand green isle of ours. It was the occasion of the crossing of the camans between the boys from Rockwell College, renowned the world over wherever an Irishman is to be found in educational circles, with the Limerick representatives, or the boys from the Treaty Stone, in the final of the Dr. Harty Cup and set of medals." About a thousand people attended and Rockwell had the better of the exchanges. They were somewhat heavier than their opponents and, with the aid of the breeze, led 3-2 to 0-0 at the interval. In the second half, they held their advantage, partly due to bad marksmanship on the part of Limerick, and were ahead by 5-2 to 2-1 at the final whistle. The victorious side was Sheehan (Captain), Fleming (goal), PooIe, ColI, Foley, Scully, Brosnan, Ryan, Chawke, Hickey, Duffy, McCarthy, O'Connell, Hackett, McCall. According to the Journal, Fr. McGrath and Mr. Mackey brought a "Galaxy" of prizemen to the match. When the team and the supporters returned to the College, the Superior made a short speech to the victors. That was at 8 p.m. but "because the light short-circuited, the boys went to bed at 8.30." The next day was a free day in celebration of the win. The Fathers had coffee after dinner. The All-Ireland was not played until June 3rd. No fear then of injury to the examination students! In Preparation, the team played'a strong fifteen from Thurles at Rockwell on May 6th. Tom Semple came with the team and put up two "rise and strike" medals to be competed for by Rockwell and Thurles. A Rockwell boy was the winner in each competition. The team went to Blackrock the night before in preparation for the match against Roscrea at Croke Park the following day. In a very moderate game, Rockwell overwhelmed their opponents by 6-1 to 1-0, having led by 3-0 to 1-0 at the interval. Roscrea had 160 boys that year as against 101 at Rockwell. One of these was referred to as "The Tragedy of the Gorgonzola". Apparently in January, Fr. Colgan received a present of a large piece of Gorgonzola cheese and stored it in a hideaway near the parlour. The Nurse scented it out, and objecting to the aroma, consigned the whole thing to the flames. The Superior, Fr. Byrne, had befriended Fr. Matt Ryan, PP, Knockavilla. On St. Patrick's Day, Fr. Ryan and the Knockavilla clergy dined with the community. There were songs and speeches over coffee. According to the entry, "Mr. Hanrahan's 'company' gave a performance of the 'Eloquent Dempsey' which fell a bit flat." At the end of March, most of the boys went home for Easter. Not all, however. Some twenty stayed on together with eight scholastics. On April 2nd, the Prefects, scholastics and the boarders went to the matinee at the Kinema (sic), Cashel. In May the scholastics began to complete the handball alley. They also acquired a new boat which was christened the Stella Maris. Two coracles, which they had been using up to then, were deemed unseaworthy and burned. Towards the end of the month, they started croquet. Winning the All-Ireland earned the boys a free day on June 4th. A week after, the non-examination students, forty boarders and eighteen scholastics, went home. Nine scholastics were held back for manual labour. There were sixty boarders and ten scholastics for examination. There were two centres in the boys' Refectory. The examinations began on June 12th with Mr. Cooney superintending. The boys went home on June 21st with the exception of the Matric students. As well as the Rockwell boys doing the Matric here, there were five outsiders, four from Cashel and one from Bansha. If you arrived as a student in Rockwell College in September 1924 the Superior, or President as he is called now, was Fr Johnny Byrne and he had held the position since 1916. The Bursar was Rev. J. A. Kingston and Fr J. McCarthy was the Director of the Scholasticate. The impressive Fr Dan Murphy, D.D. Ph.D., M.A. was the newly appointed Dean of Studies while Fr F. Griffin was the Dean of Discipline. The lay professors included Sean Gallagher, M.A., M. Nagle, who had a B. Comm. and a Mr O'Hanlon, M. Sc. There were six prefects and thirteen lay brothers, two of whom, Eugene and Agathon are of not too distant memory. Br. Eugene was in charge of the refectory and Agathon of convalescents. The number of pupils in the college was eightyfive boarders, thirty-six scholastics and some fifteen day boys. The numbers had been in steady decline since 1920-21, when the combined boarders and scholastics had stood· at 194. This figure dropped to 161 in 1921-22, 125 in 1922-23. It remained the same for 1923-24 but dropped again for 1924-25. According to the community Journal for September 1914, the decrease was to be ascribed mainly to the rise in pension, to the slump in business and in income since the Great War. But the writer adds the comment that there must have been some other cause because 'our neighbours, the Trappists at Roscrea, have this year 183 boys and even the Dominicans at Newbridge 131'. The writer may have been implying that the 'other cause' was the republican ethos of the place since the advent of Fr Byrne as Superior in 1916. De Valera and the Republicanism of Sinn Fein was the prevailing political philosophy. In fact, one of the brothers, Malachy, was so much of that persuasion, that he was nicknamed 'De Valera' . The same brother was alleged to have ensured that some of his confreres received no polling cards at election time because 'they would only vote for the other side anyhow!'. The College, under Fr Byme, was a place of refuge for republicans during the Civil War and after. De Valera was a frequent visitor and an entry in the Journal for March 17, 1925 records one such visit; 'During dinner De Valera turned in and had a hurried snack in the parlour. The Superior, Frs. Kingston, D. Murphy and Heelan went out from dinner to see him'. We're not told if he stayed around for the entertainment that evening. The students put on a program in aid of the African Mission Fund. The program consisted of the Irish comedy, The Mineral Workers, selections by the College orchestra, recitations and vocal items. A fine crowd attended and a goodly sum was realised for the cause. Part of the prevailing ethos was the encouragement of things Irish, particularly Irish games. This encouragement was reflected in the success of the hurling team. The seniors won the Harry Cup. defeating Limerick C.B.S. by 7-3 to 3-4 in the fmal at Thurles on May 18, 1924. As a result the team qualified to play Roscrea in the All-Ireland on June 15. (No worry then of getting injured before the public examinations!) Roscrea were unable to field and the Central Council of the G.A.A. awarded the game to Rockwell. The gold medals for the winners eventually arrived in Rockwell on October 3. In 1925 Rockwell beat Thurles on March 29 but, according to the Journal 'the margin was very narrow, the game feeble and uninspiring. Are we on the downgrade in games as in numbers?' And the words were prophetic as the team lost the next round. Side by side with the promotion of Gaelic. games came the downgrading of 'foreign games'. Rugby was no longer played and cricket was banned from 1916 to 1946. The school day was less strenuous over seventy years ago. In September 1924 the three-quarter hour class system was abandoned in favour of hour classes and the number of classes reduced from seven to six daily. Class began at 9 a.m. with two hour classes, followed by a half-hour for catechism. There was a break until 12 o'clock, followed by two hour classes. Another break followed at 2 and the final class was from 2.30 to 3.30. Wednesday's classes were of half-hour duration and lasted from 9-11.30. The big change in September 1924 was the introduction of the new intermediate and leaving certificate examinations. They replaced the junior, middle and senior system in existence until then. In order to prepare the students for the new examinations, Rockwell introduced a system of monthly examinations with a galaxy to reward those who did well. We read that a galaxy went to Dublin to a match at Croke Park on November 22 (Bloody Sunday commemoration!). At the end of the year, on the occasion of Prize day, Fr. Dan Murphy welcomed the new examination system and in doing so outlined the deficiencies in the old: 'The griefs laid at the door of the old system were many and varied. The minor complaints I shall not say to mention. But .there is one thing for which, I think, the system was responsible and that is, its failure to give those who studied under it that really intellectual development without which it is normally impossible to rise to the heights of one's profession in after life. It was a system which developed rather the memory than the intelligence, which favoured the system of cram rather than the gradual, internal development of all man's faculties. That system, as I say, has disappeared and the principles underlying the new system conduce far more to the full development of all man's faculties, than the system under which we have been working for so long'. He had one criticism of the new system. While it exacted much more from pupils and masters than the old system, the rates of remuneration for teachers hadn't increased at all! Fr. Murphy produced impressive statistics to show Rockwell's achievements under the old system during the previous six years. Its pass rate had been very good: in 1919,77 out of 112; in 1920, 79 out of 101; in 1921,69 out of 92; in 1922, 80 out of 89; in 1923, an exceptional 59 out of 61; in 1924, 59 out of 64. He believed the high percentage of passes, secured by Rockwell in every grade, showed that the members of the staff must have reserved their best efforts for the advancement of the ordinary boy of normal ability. This he regarded as indicative, not alone of the greatest conscientiousness, but also of the highest educational training. During the six years mentioned the average pass rate for all Ireland never went much beyond 50 per cent and he ventured to affirm that there were few colleges in the country that could show a better record of passes during the year. In spite of this favourable picture there was talk during 1924 of closing down the College! It hasn't been possible to trace where this scare originated but it may have been mentioned in the light of the falling numbers. There is a reference to it in the Journal for October 26. Apparently, at the consecration of the Church in Cashel, Dean Innocent Ryan 'unhappily and needlessly harped back to the project of closing the College'. Previously, (on May 18) he had referred to a 'plot' to close the College. Now he said it 'was missionary zeal that underlay the proposal and that it was solely through the action of the priests of the Archdiocese of Cashel that the measure was rejected'. However, strong the notion of closure had been at any time, by October 26 it appears as if it had been put aside and was best forgotten. And, a few final entries will add to the flavour of the period. September11, 1914: 'College invested in a car. The hall door servant, Luke Lyons, has been trained as chauffeur'. January 28, 1925: 'Sold 23 cattle at £19 average'. And 'The Crossword puzzle craze is rife among the staff'. March 3: 'The fathers were asked to think over the proposal to feed the boys better and to raise the pension to £60 or £65'. And 'The hounds came and found 2 foxes in our Black Grove'. May 17: 'The boys walked to Cashel, caught a Rockwell special train at 1.30 and went to Thurles to see Cork beat Limerick. They got back at 8.45'. May 19: 'Half year's increment of salary came from Hume Street. The max at present is £120 per annum'. June 11: 'Cinema pictures of the College were taken from the Pathe's Gazette'. The picture is nearly too good to be true and the problem with it is the absence of any boy's voice from the year telling us how it looked from his perspective. It may come as a surprise to many that Rockwell College has a very respectable record in the Harty Cup, the Munster Colleges' top hurling competition. Tipperary schools have won the cup on thirteen occasions and Rockwell come second in the table of winners vith five victories to Thurles C.B.S's six. Rockwell's last victory was in 1931 and Thurles C.B.S. achieved theirs in 1956. The Abbey C.B.S. in Tipperary won out in 1959 and the last Tipperary school to succeed was Templemore C.B.S. in 1978. Various attempts were made to organise games in secondary schools in Munster in the first two decades of this century but the first really successful one was the presentation in 1917 of a cup by Archbishop J. M. Harty, Archbishop of Cashel and Emly, for a hurling competition between the secondary schools and colleges in the province. The background to this development was a motion to the 1916 County Tipperary G.A.A. Convention from E. D. Ryan of Cashel. The motion called upon the colleges and secondary schools within the county to give our national pastimes a foremost place in their games. E. D. Ryan found it inconceivable how the schools and the colleges of the county could afford to ignore Gaelic games. He suggested that a deputation visit the principals of various colleges to get an explanation from them as to why they didn't give a foremost place to the national games. "The colleges wholly supported the games of snobocracy and this gave an artificial appearance to the youth of the country, who knew nothing about foreign games prior to heir entrance to the colleges", he continued. After some discussion a deputation was appointed and it included E. D. Ryan. The next development was a Munster schools' and colleges' meeting at Limerick Junction on June 2. This meeting was called to discuss the position of Gaelic games in the schools and the organisation of a competition or a football cup, put up by the Munster Council. (Dr. Harty's Cup was for a hurling competition). It was agreed that the committee governing the competitions have one member per county and that the chairman have a casting vote. The age limit for the competitions should be nineteen years on the 1st June each year. One of the schools' representatives hoped that the foreign games rule would not be implemented too strictly. It was agreed to meet again in September to organise the competitions for the next school year. At that meeting it was agreed to reduce the age limit to eighteen on January 1st, 1918. The football competition got off the ground immediately and was won by Rockwell, who defeated St. Brendan's, Killarney by 2-4 to 0-1 in the semi-final and St. Colman's, Fermoy in the final, which was played at Kimallock. The successful Rockwell side was as follows: E. Reilly (goal), J. Lyons (captain), J. Moran, N. Moroney, T. Ryan, C. M. Vaughan, J. Quinn, W. McCarthy, P. O'Dwyer, T. O'Callaghan, M. Costigan, M. Fox, M. Quinn, S. Hughes, J. Healy. The football competition lapsed after this and wasn't played again until 1928 when it was won by Clonmel High School. So Tipperary schools were victorious on the first two occasions of this premier Munster football competition but haven't been successful since. The draws for the first Harty Cup competition were made in January 1918. Rockwell got a bye in the first round and went on to qualify for the final against Christians College, Cork, at Thurles on April 25th. They had an easy victory, winning by 5-5 to 3-1. The ball was thrown in by Most. Rev. Dr. Harty and afterwards he presented the cup to the Rockwell captain and the medals to the victorious team. The winning side was: J. Daly, M. Collins, E. O'Donnell, M. Fox, K. Egan, J. Quinn, M. Quinn, P. Power, W. Aherne, W. McCarthy, T. Ryan, T. Lynch, T. O'Connor, J. Maher, W. Ryan. Rockwell achieved a double when they won the competition on successive years, 1923 and 1924. The '23 final was played at Thurles on April 22nd, against Limerick C.B.S. The reporter on the "Tipperary Star", set the scene: "Sunday in Thurles reminded me of old days, the old days I mean before the troubles arose in this grand green isle of ours. It was the occasion of the crossing of camans between the boys from Rockwell College, renowned the world over, wherever an Irishman is to be found in educational circles, with the Limerick representatives, or the boys from the Treaty Stone, in the final of the Dr. Harty Cup and set of medals" . About a thousand people attended and Rockwell had the better of the exchanges. They were somewhat heavier than their opponents and, with the aid of the breeze, led 3-2 to nil at the interval. In the second half they held the advantage, partly due to bad marksmanship on the part of Limerick, and were ahead by 5-2 t 2-1 at the final whistle. The victorious side was Sheehan (captain), Fleming (goal), Poole, ColI. Foley, Scully, Brosnan, Ryan, Chawke Hickey, Duffy, McCarthy, O'Connell. Hackett, McCall. Rockwell retained the cup in 1924 against the same opposition. In earlier games Rockwell beat Thurles by a large margin and North Monastery by 7-5 to 0-1 in the semi-final. Nine schools took part in the competition and the final was played at Thurles on May 18th. According to one report: "It is no exaggeration to say that the meeting of Rockwell College and Limerick C.B.S. provided one of the fastest and most exciting games ever witnessed on the ground with all its memories of thrilling contests. Both sides fielded strong teams - Rockwell perhaps having the advantage in weight - and it was soon evidenced that both were well-trained, well-selected combinations". Limerick scored first but Rockwell led by a goal and a point at the interval and were in front by 7-3 to 3-4 at the final whistle. The winning side was: Teehan (goal), Nicholas, Kennedy, McCarthy, G. White, O'Connell, Jordan, O'Connell, Clarke, Dunphy, P. Powell (captain), Slattery, Kearney, Devinish, Cashman. Rockwell achieved a second double in 1930 and 1931. On their way to the 1930 final they inflicted a heavy defeat on North Monastery by 11-3 to 2-0. Their opponents in the final were Mount Sion and the game was played at Waterford on March 16th. RockweIl were completely superior. They led by 6-2 to nil at the interval and were 8-2 to 1-1 in front at the final whistle. Fr. Andy Egan, who was in charge of the victorious side, said it was the best fifteen turned out by the college since the Harty Cup began. He said he had been building up the team for a number of years and was delighted with its performance. The lineout isn't quite certain. Thirteen names only appear with the match report in the Rockwell Annual and, like so many teams at that period, may not be in the order in which they played. The thirteen are: T. Walshe, F. Hazel, N. Lawn, T. McCarthy, J. C. O'ConneIl (captain), W. O'Donnell, P. Kennedy, M. O'Keeffe, T. Cummins, L. Dillon, T. O'Dwyer, F. Matthews, M. Tubridy. The remaining two may have been selected from P. Byrne, G. Keely and M. O'Sullivan. The Harty Cup was retained in 1931, despite Fr. Andy Egan's fears after the previous year's victory that he wouldn't have any players for the following year. The final was played at Mitchelstown in April against the unlikely opposition of Doon C.B.S. The first half was a hard-fought battle at the end of which Rockwell led 1-1 to nil. The second half was disappointing as a spectacle as RockweIl establised their superiority and ran out easy winners by 6-1 to 1-1. The winning side, not in order of lineout, was as follows: C. Meagher, D. Cronin, T. O'Dwyer, P. McMahon, T. Dillon, M. O'Dwyer, J. McCarthy, P. Maher, M. Ryan, P. Kennedy, T. Walsh, P. O'Sullivan, T. Cummins, J. Brennan, M. Burke, D. Coughlan. This fine record of five Harty Cup titles in fourteen years was not continued. Rockwell never again qualified for a final. Rugby took over as the dominant game and equally impressive results were achieved in that code.